By Dan Ambrose: Miguel Cotto (40-5, 33 KOs) is considering extending his career beyond 2017 into 2018 to fit in fights against Saul Canelo Alvarez and Juan Manuel Marquez. 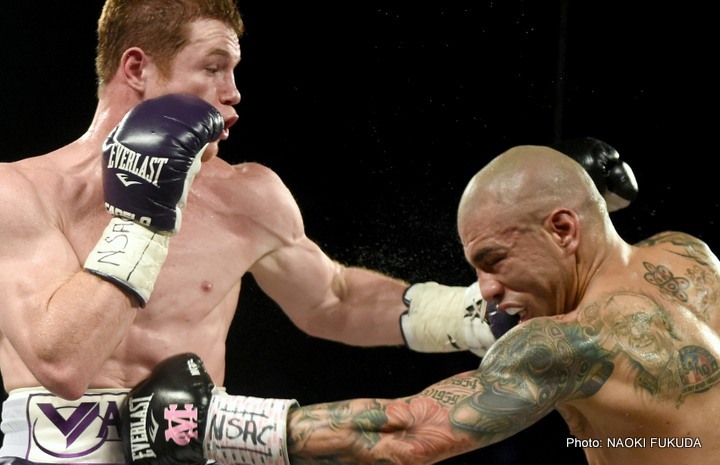 Cotto vs. Canelo II is a real possibility for December. Cotto-Marquez would need to wait until 2018 if Cotto chooses to extend his career. Cotto already lost to Canelo in 2015, but the fight generated 900,000 PPV buys on HBO. A rematch between Canelo and Cotto has been talked about for the end of 2017. The only thing that could get in the way of the second Canelo-Cotto fight is if one or both of them lose their next fights. Canelo has a really tough match-up against middleweight Gennady “GGG” Golovkin on September 16, and he could very well lose to the Kazakhstan fighter. The only question is whether Golden Boy would be willing to put Canelo back in with Golovkin for an immediate rematch in December? It would depend on how badly Canelo is beaten how many PPV buys the fight generates on HBO. If Canelo loses, then he’ll very likely go for the easier fight against Cotto rather than face GGG a second time. Cotto is taking a fight on HBO Boxing on August 26 against #5 WBO Yoshihiro Kamegai (27-3-2, 24 KOs) for the vacant WBO junior middleweight title at the StubHub Center in Carson, California. Cotto, 36, recently left Roc Nation Sports and signed a 2-fight deal with Golden Boy Promotions that expires at the end of 2017. That’s when Cotto could fight Canelo. However, if Cotto extends with Golden Boy, he could face 44-year-old Juan Manuel Marquez (56-7-1, 40 KOs) in 2018. For that fight to happen, Marquez would need to be able to make it through training camp without his knee problem keeping him from fighting. Marquez hasn’t fought since 2014. At this point it’s unclear how much you’re going to be able to get from Marquez. The boxing world doesn’t need a repeat of what we saw recently with Canelo beating up on a past his best Julio Cesar Chavez Jr. or the dud between injured Manny Pacquiao and Floyd Mayweather Jr.
“With Golden Boy we have an agreement until the end of the year. Thanks to the months that we have been out for the lack of fights, the cancellations of fights, we will be thinking that we could extend a little more,” said Cotto to ESPN.com. As you can see, there’s a lot ifs involved. Cotto and Canelo likely both need to win their next fights for the possibility of a fight between the two of them to face each other in December on HBO PPV. Cotto looked pretty bad in his last fight against Canelo in November 2015. Cotto looked small and weak in comparison. Cotto’s trainer Freddie Roach has spoken about wanting a rehydration clause in a rmeatch against Canelo to keep him from rehydrating 30 pounds. That’s how much Roach thinks Canelo rehydrated the last time Cotto fought him. It doubtful Canelo would agree to a rehydration limit, but you never know. If Canelo loses to Golovkin, he won’t be in as good a position to call the shots in the negotiations. A fight against Marquez might not be that big of a deal at this point for Cotto. When you’re talking about a fighter that’s 44 and has been out of the ring for 3 years, there’s no way of knowing whether the boxing public would be interested in purchasing a fight like that. Cotto vs. Marquez might be viewed as an old timer type fight, because neither guy is relevant at this point in boxing. Yeah, Cotto has been given a No.1 ranking by the World Boxing Organization at 154, and they’re letting his fight against Kamegai be for their WBO junior middleweight title, but it doesn’t make the fight seem authentic in this writer’s opinion. A lot of boxing fans reacted negatively on Wednesday at the news of the Cotto vs. Kamegai fight being for the vacant WBO junior middleweight title. Some boxing fans grumbled that Cotto hasn’t fought in 2 years and is coming off of a loss in his last fight. They don’t think Cotto rates to be fighting for the WBO 154 lb title. The fans also pointed out that Kamegai has a record of 3-2-1 in his last 6 fights. He’s not someone that rates a world title shot. The WBO giving Cotto a No.1 ranking with their organization makes it seem to some that it’s based on his popularity rather than on what he’s done lately, which is basically nothing. Getting a No.1 ranking and a title should be earned though staying active, winning fights, and beating quality fighters. Like I said, Cotto hasn’t fought since 2015, and hasn’t won a fight since beating Daniel Geale in June 2015. “We will do what suits us best,” said Cotto about the Canelo and Marquez fights. “We can fight with anyone as long as it is the best option for Miguel Cotto, there is no preference for anything,” said Cotto in speaking in the third person like he sometimes does. It’s nice the way that Cotto talks about him picking the best option for himself. At this point in Cotto’s career, there are very limited options, because he’s clearly looking for the best paydays available against established pay-per-view fighters. We’re probably not going to see Cotto want to prove him against the true best at junior middleweight or middleweight by him facing Golovkin, Erislandy Lara, Jermall Charlo or Jermell Charlo. Those wouldn’t be big money fights for Cotto, and they would almost surely end in disaster for him. Cotto used to be a decent fighter in the past, but he’s up there in age now and he’s had a long layoff. It just looks like he’s coming back for payday fights rather than to fight the best. What will look bad is if Cotto chooses to fight Canelo even if he gets beaten by Golovkin on September 16. If Cotto still wants to fight Canelo rather than Golovkin under those circumstances, it would make it seem more like business than for the sport. Ideally, Cotto should fight the winner of the Canelo vs. Golovkin fight because that would show that he wants to fight the best rather than just the most popular. I don’t think Cotto will do that through. I see him ignoring Golovkin and taking the fight with Canelo even if he’s knocked out in the 1st round by Golovkin. Cotto recently separated with Roc Nation Sports after just 2 fights with the promotional company. It was said that the money wasn’t there for Cotto to fight Kamegai. According to ESPN, HBO wasn’t going to take the fight between Cotto and Kamegai without a commitment to a bigger fight in the future because it’s not a great fight. But with Cotto now looking at fighting Canelo possibly in December, it gives HBO a big fight between those two. With that fight just over the horizon, it’s not that bad that for the network to put on a potentially bad fight between Kamegai and Cotto. A fight between Kamegai might turn out to be an exciting affair because the Japanese fighter likes to slug it out with his opponents. The reason why Cotto vs. Kamegai is such a bad one is the fact that the casual boxing fans don’t know Kamegai is in the U.S. For that reason, the fans might not care to see Cotto face Kamegai on HBO. When you makes matches like Cotto-Kamegai, it has the potential for low ratings for HBO or any network that televises the fight. It’s not main event material. Cotto and Kamegai would be a decent third fight from the top type of match, but not a main event or even a co-feature bout.